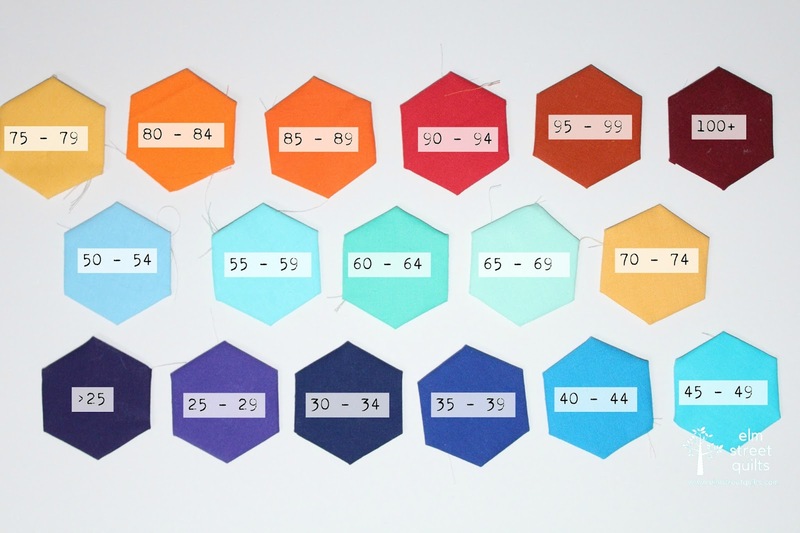 It only takes a few minutes (6 actually) to attach a pre-made hexie onto temperature quilt. The first row (of color) on the top is January 1 through 15, next column January 16 through 31 etc which means the last row on the bottom is May 16 through May 31. (May 31 (85+ day) is the orange one on the left in that bottom row.) I'm using a low volume fabric to fill in months that don't have 31 days plus surrounding the overall temperature quilt as you can see surrounding the quilt on left edge, top and bottom. 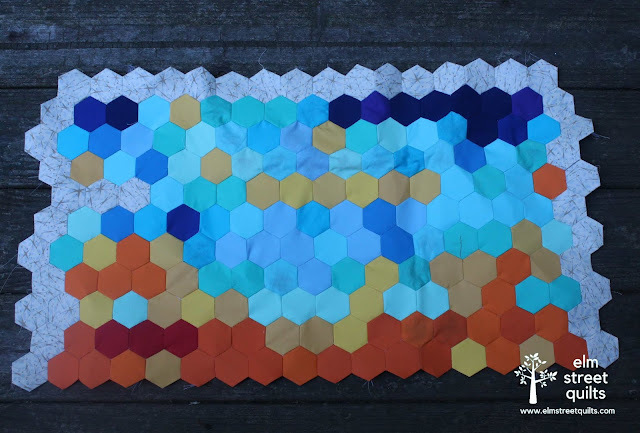 The quilt measures roughly 32'' x 16''. May brought us a couple of days in the 90s and plenty of days in the 80s. There are actually two shades of oranges in there. The color difference between the two is a bit easier to see in person. Here is the mapping of color to temperature range - I'm using the high temperature for the day and sourcing the data from here. 6 minutes a day? That's pretty awesome. I am really interested to see how the colors and temperatures progress through the year. Me too! I can tell I am going to get very, very tired of orange! I love this every time I see it! What a fun way to record the year! I also love that the size is not too overwhelming - do you do them in bits or all at once? I try to add one each day while I am (patiently or not) waiting for my daughter to get ready. I pre-make up the hexies so it makes it fast and easy each night. Orange hexies on the way! Since I love to swim, I don't mind the heat but I am happy to share! This is really looking cool!!! Such a neat plan! Having the hecies pre-made is certainly a great way to accomplish your daily goal! Thanks. I've got to pre-make more oranges though - I've been going through those quickly! This is a great quilt idea. What will you do with the finished quilt? Thanks. My goal is to make this a wall hanging for my husband who happens to be a meteorologist! Thanks. And I'm kind of surprising myself actually! I get a kick out of this every time you update us. It's so fun!